Description: herbaceous perennial (3-4 ft. round) with reddish stems and small, palmately compound leaves. 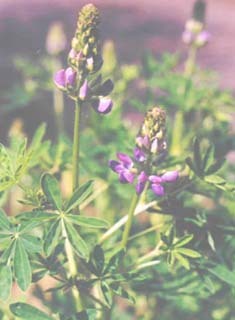 Its racemes of purple flowers are tipped with white (summer). Good bee & butterfly plant. Stream-bank lupine also grows in wet meadows and sandy streambanks. Sun/part sun, low-regular water (will tolerate less), well-drained soil.